Royal Octopus Dive Center offers the following Padi Courses. Diver's first certification. As a certified PADI Open Water Diver, the most widely recognized and respected rating in the world,you will be able to dive with another certified diver up to 18 meters,whenever you like. 4 days with theory, to develope knowledge development in classroom,confined water for skills practice and 4 open water dives. You must be older than the age of 14 years to begin the PADI Open Water Diver program. For those of you who are not above the age of 14 years and would like to participate in the PADI Open Water Diver Program, then the PADI Jr Open Water Diver program is available to you.A PADI Junior Open Water Diver between the ages of 10 and 11 years may only dive with a PADI Professional, a certified parent or certified guardian to a maximum depth of 12 metres/40 feet. This one day course learns you about primary and secondary care, not only for diving injuries. It's suitable for enery diver, not only for those who want to be professionals. It's required for the Rescue Diver Course. Learns you to prevent and manage problems in the water and become more confident about your diving skills.Prepares you for any underwater emergencys,major or minor.You are practicing with theory in class and through diving accidents scenarios.Minimum age: 15 years old (12 for PADI Junior Rescue Diver)Successful completion of a sanctioned CPR program within the past 24 months. The Emergency First Response Primary Care (CPR) and Secondary Care (First Aid) courses meet these requirements. This is the highest, non profesional, recreation certification. 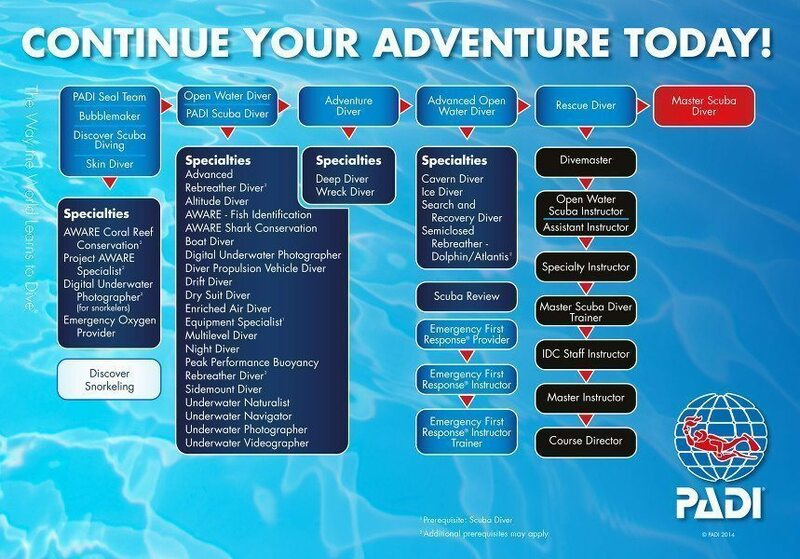 It demands 50 logged dives and completed 5 specialities courses and be certified as an Advanced and Rescue Diver. Become a profesional .A leader that mentors and motivate other divers.Gain more dive knowledge,super vision abilities to prevent problems and become a role model to divers around the world.What can PADI Divemasters do?